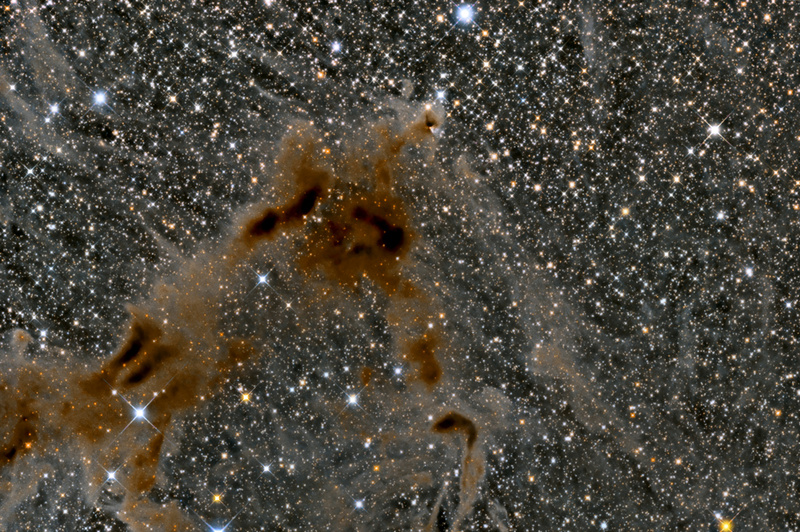 This region ofthe sky in the constellation Cepheus contains reflection and dark nebulae, which were cataloged by Beverly T. Lynds in his "Catalogue of Bright Nebulae" and "Catalog of Dark Nebulae". LBN is the bright nebula near the center of the image. Clockwise from bottom left are LDN 1148,LDN 1155 and LDN 1158.At about 1 o'clock from LDN 1158 is the small reflection nebula GM 1-29, which is illuminated by the variable star PV Cephei. Together this combination is known as Herbig-Haro 215 (HH215).